Sometimes I just like to eat simply and cook simply. Just a few ingredients and an easy recipe is perfect for dinner after a busy day. I don't know about you, but I really don't feel like cooking anything too complicated when I get home from work. But I do like to sit down to a hearty and healthy meal. It just makes you feel better after a hectic and stressful day. This recipe was inspired by Rachel Ray. It is a great technique of braising using only 6 ingredients. That I can handle! Put all ingredients in a medium/large high sided saute pan. Bring to a boil, reduce heat to medium and cook until broth has evaporated and a glaze has formed. 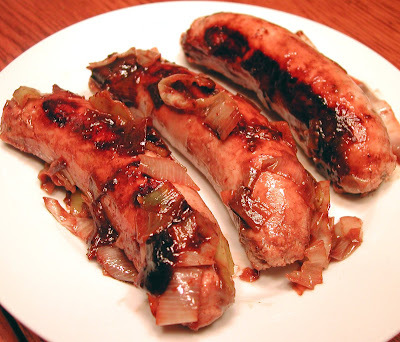 Turn sausages after 10 minutes and continue cooking. Remove sausage and leeks and place in a serving dish; cover with foil. Add 1/4 cup dry white wine to the pan, scrap up browned bits and cook for about 3-5 minutes until reduced. Pour over sausage and leeks and serve. Hi Annie! I think I remember seeing RR do this on her show...it looks so good! I love simple too...this looks delicious and healthy! I'd love these in a sandwich. Aggie, Yeah simple is the way to go! And RR has some good ideas on that. Lisa, You are right. I would too. Next time, since I didn't have any rolls. Em, Hey I can't leave a comment on your blog.. What is wrong and is it on my end or yours? I have GOT to try this! it looks so good! Just made this for dinner--fantastic! And Lisa's right, they'd be great in a crusty roll!